The Editing section in the Home tab provides the Select Area and Delete options. The Find feature allows you to search for keywords on your Mind Map and also can be used to locate text that may be included on a Branch Note. The Select Area tool allows you to drag and drop a selection around a group of branches or items in order to select them all in one go. Select the Area button from the main toolbar. Drag and drop the mouse over the area of branches you wish to select. Simply press the Delete button in the Home tab. 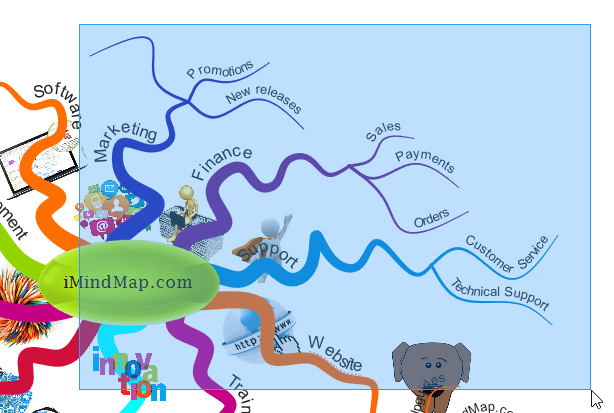 Tip: If you accidentally delete an item you can always use the Undo or Redo buttons in the top left hand corner of the iMindMap window. The Editing section in the Home tab allows provides the Find, Select Area and Delete options. Select Next to begin searching, if you have multiple instances of the keyword you can keep pressing Next or Previous to go back and forth between them. Hold down the Cmd key. Drag and drop the mouse cursor over the area of branches you wish to select. You can also find the Select Area option from the Edit > Select menu on the top toolbar. Simply press the Delete key. 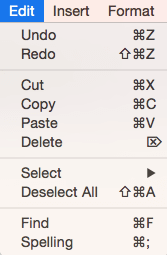 Tip: If you accidentally delete an item you can always use the Undo or Redo options from the Edit menu or use the Cmd + Z short cut key.